Every support team faces: How can I take a number of inbound reports stemming from the same root cause and collect them so we can attack the root cause of the issue, then solve them all simultaneously? With Zendesk Support, now you can. Your customers have different reasons for getting in touch with you. As such, not all Zendesk Support tickets work the same way. A ticket can be one of four types: a Question, a Problem, an Incident, and a Task. Each of these types allows you to track and do different things, with the ticket, based on the issue at hand. Problem-and-incident tickets are useful when a problem or service interruption is reported by more than one person. For example, when the wireless network in an office stops working, several people might report the incident. A ticketing system, like Zendesk, can treat the tickets as incident reports. Instead of resolving each ticket separately, you can link the tickets to one problem ticket, and then find a resolution to the problem ticket to solve all the incident tickets. 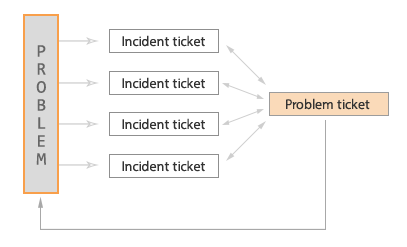 Learn how we manage problem-and-incident tickets here at Zendesk in Joseph May's Zendesk on Zendesk: Lifecycle of a problem ticket. There’s a lot more where this came from. Keep exploring the world of incident ticket systems, global customer support, and agent efficiency.